You’ve undoubtedly noticed a tall, vertical grass, planted en masse, swaying in the wind at the entrance to the mall, in your neighbor’s yard, or most likely, at the Chicago Botanic Garden. 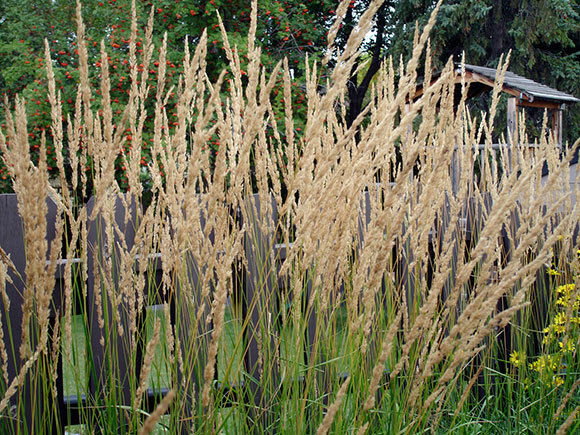 Feather reed grass (Calamagrostis × acutiflora ‘Karl Foerster’) has, for good reason, become a staple in perennial gardens. This hybrid of two species native to Europe and Asia can thank German nurseryman Karl Foerster (1874–1970), for discovering the species in the 1930s along a railway in Germany. It is reported that he pulled the emergency brake on the train he was riding in order to collect the plant. The cultivar ‘Karl Foerster’ was named to honor him. Karl Foerster, son of a painter and an astronomer, was well known for his unique and innovative plant selections at his nursery in Potsdam-Bornim, Germany. The nursery focused on breeding hardy perennials from all over the world. Foerster successfully bred approximately 370 crosses, with a particular interest in clumping grasses, Delphiniums, and Phlox. Originally propagated at Foerster’s nursery, Rudbeckia fulgida var. sullivantii ‘Goldstrum’ is another perennial that remains popular today. Foerster’s nursery endured difficult times over the years yet managed to survive the Great Depression and World War II, during which he is said to have employed Jewish friends despite the risk. As a plant breeder and garden designer, Foerster helped to popularize the use of grasses in garden design and heavily influenced the “New German Garden Style” which focuses on low-maintenance gardening and four-season interest. Those concepts continue to be popular in garden design today. Mimicking the American prairie, this dynamic gardening style blends both native and cultivated plants with a goal of low maintenance. One can easily see similarities to the “New German Style.” At the Chicago Botanic Garden, Evening Island was designed by Oehme, van Sweden & Associates landscape architecture firm and is representative of the “New American Garden Style.” Sweeps of perennials and grasses weave harmoniously through the landscape of Evening Island, softening the transition between the formal gardens of the main island and the native Dixon Prairie. With perhaps a nod to the past, Calamagrostis × acutiflora ‘Karl Foerster’ is a favorite of Oehme and van Sweden and in my opinion one of the stars of the Evening Island plant palette. 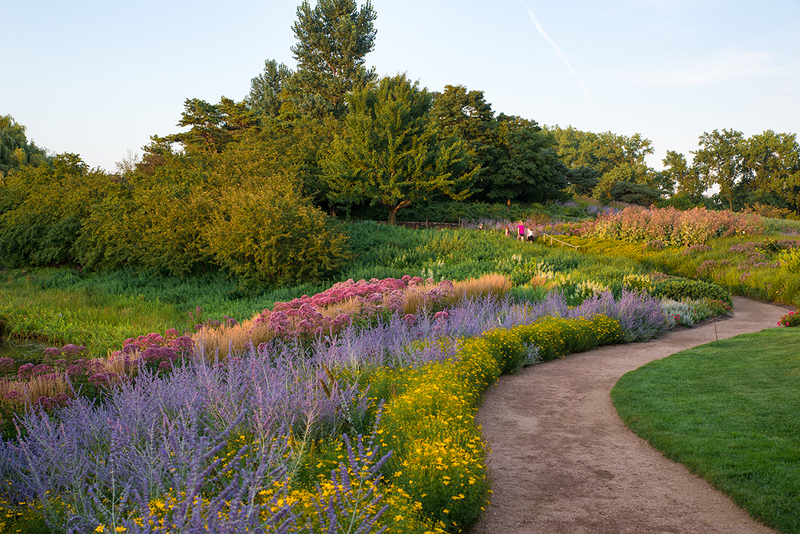 Sweeps of perennials and grasses weave harmoniously through the landscape of Evening Island. 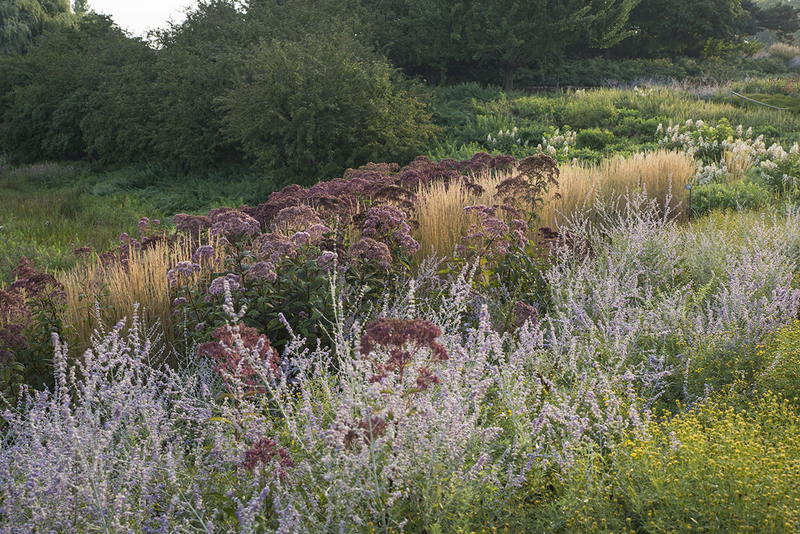 Sandy-colored Calamagrostis × acutiflora ‘Karl Foerster’ is a cornerstone of the landscape design by Oehme, van Sweden & Associates. The most notable characteristic of Calamagrostis × acutiflora ‘Karl Foerster’ are the 5-foot flower stems that tower over a shorter but dense clump of narrow leaves. Purple-tinged plumes of flowers emerge in late spring and as the seeds (which are sterile) mature, the flower stalk turns a sandy color by fall. The seed stems continue to act as a vertical accent through the winter months making it truly a four-season plant. While full sun and well-drained soil with adequate moisture are ideal, this plant can tolerate some shade and heavier clay soils. However, you will see fewer flowers and floppier foliage with more shade. Drifts of this clumping grass are reminiscent of a field of wheat dancing back and forth in the wind. Interrupting the sweeps of grass with a pop of color from another perennial such as Leichtlins’ lily (Lilium leichtlinii), Russian sage (Perovskia atriplicifolia), or purple coneflower (Echinacea purpurea) will add an element of surprise to the garden. While planning your garden for this year, take a leaf out of Foerster’s book and give Calamagrostis × acutiflora ‘Karl Foerster’ a try! Reimann, Dorothy. “Herr der blühenden Gärten.” Monumente, June 2005, https://www.monumente-online.de/de/ausgaben/2005/3/herr-der-bluehenden-gaerten.php?seite=1#.WldsJK6nGUl (accessed January 23, 2018). Rettig, Larry. “Karl Foerster’s Lasting Imprint on the World of Horticulture,” Cubits.org (blog), April 26, 2010, http://cubits.org/articlesongardening/articles/view/325/. Van Sweden, James. Gardening With Nature: How James van Sweden and Wolfgang Oehme Plant Slopes, Meadows, Outdoor Rooms & Garden Screens. Random House Gardening Series, 1997.